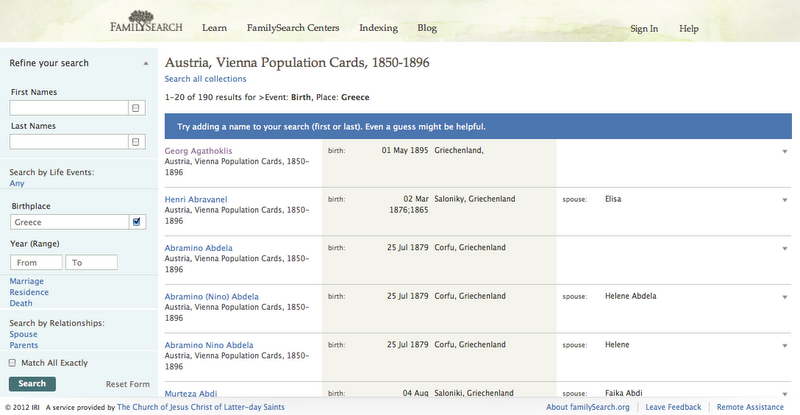 This FamilySearch database includes 87 people who are recorded with GREECE as their birthplace. I have listed their names below for your review. 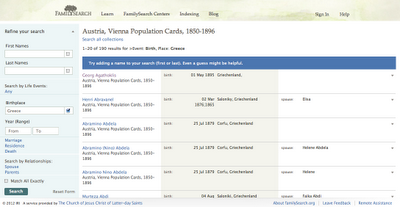 Population cards for individual residents of the city of Vienna, Austria. The cards include: name; birth date and place; marital status; old and new places of residence; and dates of arrival and departure. Frequently the names of the spouse and children are listed. Many people from the Austro-Hungarian Empire and Eastern Europe passed through Vienna and may be included on these cards. The broader collection was maintained from 1850 through 1928. The current publication, however, only includes information on individuals born before 1897 (115 years and older). - - - - You can view further information on these records at this FamilySearch.org link.